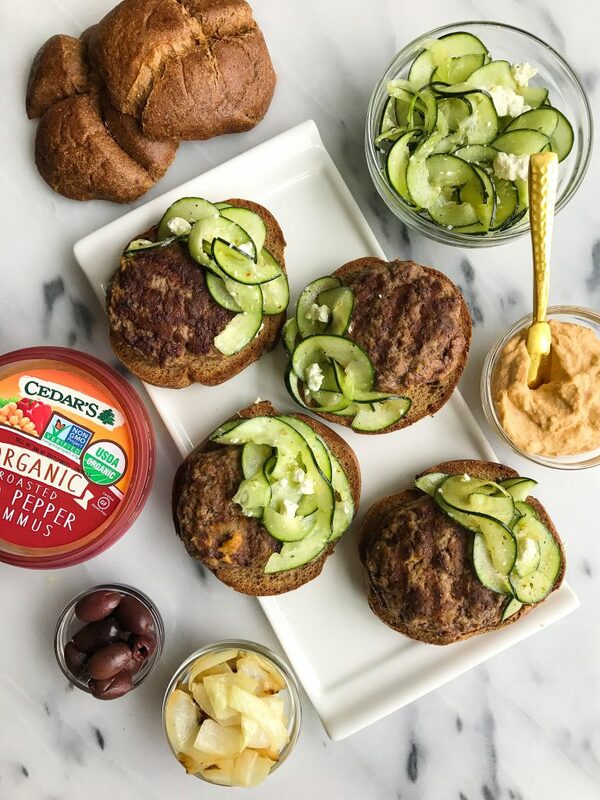 Easy Hummus Stuffed Burgers with Greek Cucumber Slaw for a healthy, delicious and easy burger recipe! I am bringing you guys a full line up of savory meals on the blog this week. A ton of you have asked for simple and healthy lunch and dinner ideas from the blog and I gotchu covered. 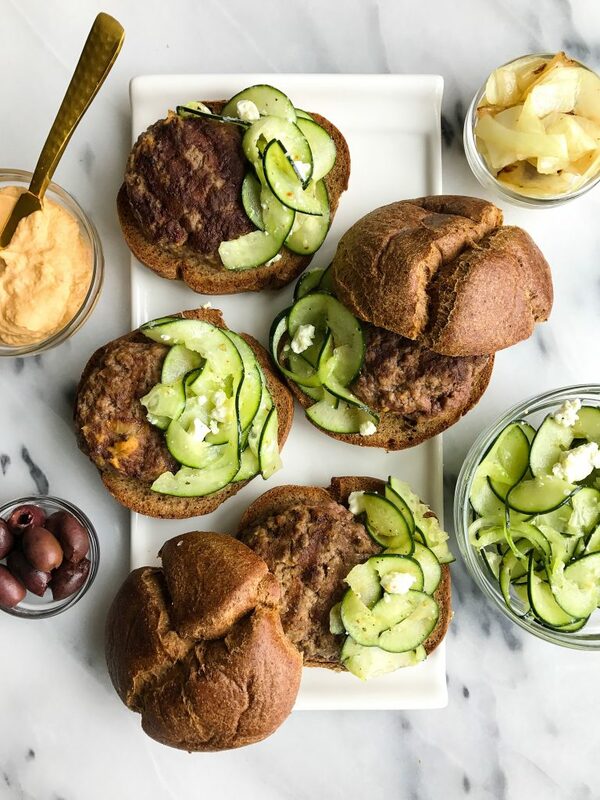 These Hummus STUFFED (yes, stuffed) Burgers are a game changer. Ever since I started eating meat again a couple of months ago, I cannot stop making homemade burgers at home. Beef, turkey lamb, anything. Basically whatever organic, grass-fed meat I can find at the grocery store each week comes home with me. My mom always used to make homemade burgers when I was younger and I remember them being so flavorful and fresh compared to when you buy already made burgers. I used to make fun of them because they weren’t as perfectly shaped, but now I know it’s because they were made from scratch (duh). 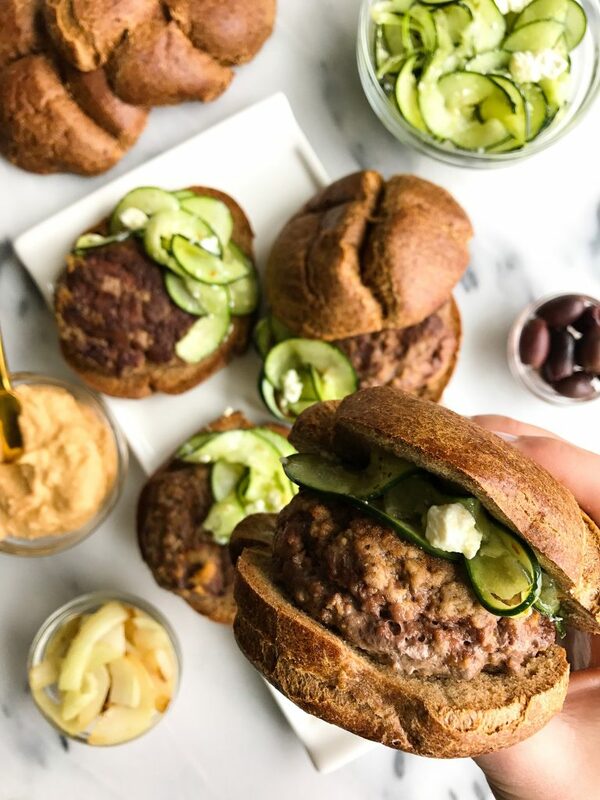 I found some grass-fed beef just intake to make these Mediterranean-inspired burgers for us. And it is paired with an easy Greek Cucumber Slaw (we all love a good slaw ya know). These burgers sound 100x fancier than they actually are I promise. You only need a few ingredients and spices and no grill is necessary. The main star of the show, the hummus, is my favorite part. I use Cedar’s Organic Roasted Red Pepper Hommus (intentionally spelling there!). It is my go-to hummus ALWAYS. It is a staple in my fridge and on my Whole Foods list each week. I love every single flavor and when they run out I always have to go to customer service counter and ask when the next shipment comes in. Cedar’s Hommus is SOO creamy and flavorful. It is made with amazing ingredients and NO canola oil! Can I get an amen?! Because that is not easy to come by in the hummus section. You can likely find me spooning it out of the container as I am making my lunch daily. Or dipping my kimchi in yet (yes it is that GOOD!). Once burgers are ready, enjoy with your favorite bun, top with slaw and more hummus! Thank you Cedar’s for sponsoring this post. It means so much to me to work with brands that I love and who support rachLmansfield! the cucumber slaw sounds delicious! Adding some tartness to the burger!! 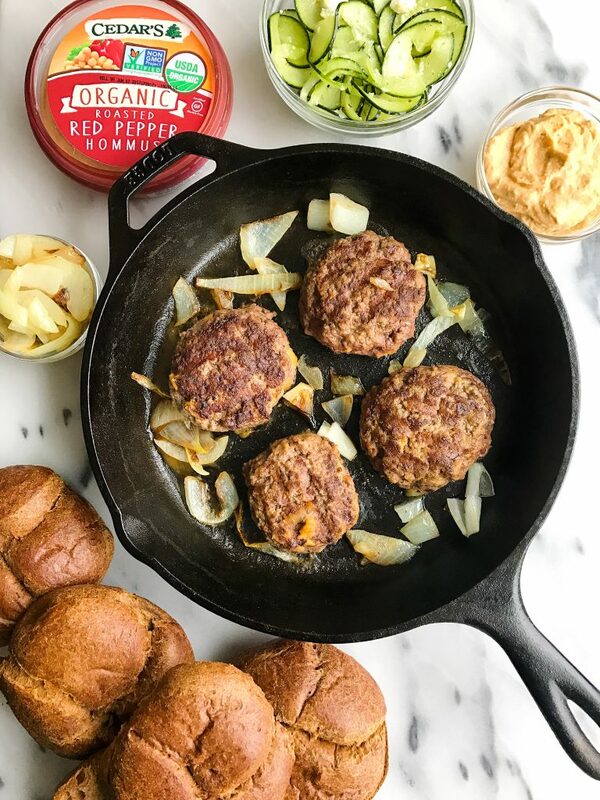 I make burgers every week, so this is a great variation to try! Wow they look so fresh and delicious and satisfying. I’ve never stuffed hummus into a burger; that’s a genius idea. Looks fabulous! Thinking of using spicy hummus, or would that be too much with the spices already in the burger? Cannot wait to try this!